It may be related to the Model 82A1®/M107®, but the M107A1 is far from a simple evolution. Driven by the demands of combat, every component was re-engineered to be lighter yet stronger. The result? A high-performance rifle that weighs five pounds less than the original M107, but is every bit as tough. 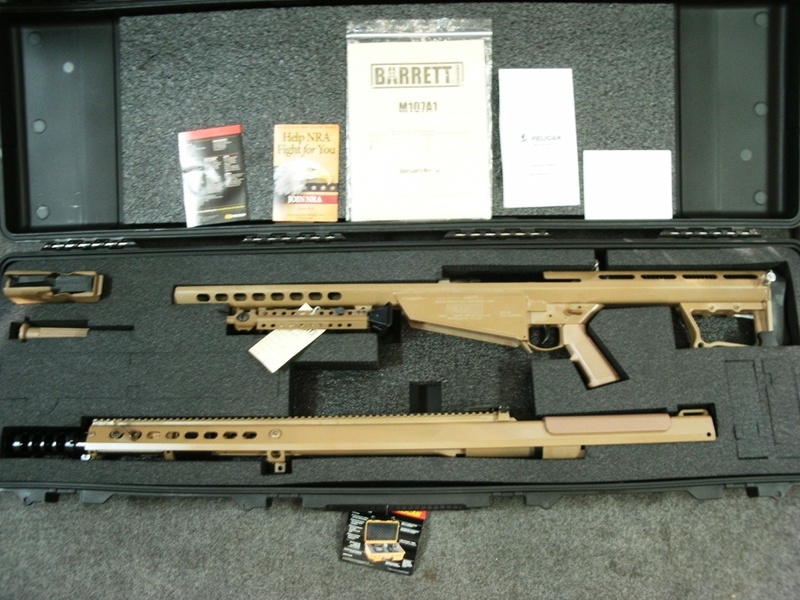 Designed to be used with a suppressor, this one-of-a-kind rifle allows you to combine signature reduction capabilities with the flawless reliability of the original Barrett M107, but with a rifle weight reduction of 5 pounds. An all new bolt carrier group has been designed and is key to making the rifle suppressor-ready. Its steel four-port cylindrical muzzle brake is engineered to work seamlessly with a quick-attach Barrett QDL Suppressor. The lightweight aluminum upper receiver features an integrated 27 MOA optics rail. Inside the upper receiver, the bolt carrier rides on a hardened steel anti-wear strip for added durability. A thermal-guard cheek piece protects the user's face from extreme heat or cold. Advanced design and manufacturing make the M107A1 more precise than ever. The rear barrel stop and front barrel bushing are bolted and bonded with a high strength compound. A titanium barrel key and fully-chrome-lined bore and chamber add to the rifle's durability. Enhanced modularity is also a key feature of the M107A1. The rail-mounted aluminum rear grip can easily be reconfigured. The newly designed titanium and polymer monopod is adjustable from either side. The M107A1 rifle's lower receiver includes a new aluminum recoil buffer system that's optimized for use with the Barrett QDL Suppressor. The bolt carrier's components are protected with a mix of ultra-hard coatings and advanced nickel Teflon® plating that increases lubricity, is corrosion-resistant and greatly eases cleaning. Retail price list reflects U.S. commercial sales only. For military or law enforcement pricing, please fill out this form. For International pricing please contact Barrett.